An important action of the #bFair2DirectCare Campaign is to encourage legislators to send a letter to Governor Cuomo urging him to include $45 million in his Executive Budget Proposal as a first step towards providing a living wage for low wage workers who support people with developmental disabilities. A letter was sent to every member of the New York State Senate and Assembly urging them to write to the Governor regarding this issue. In addition, two sample letters were provided to the members of the Legislature to either send to the Governor or use as models for their own letter. We ask that every Affiliate follow-up with their local legislators and urge them to write to the Governor. Call those legislators known to you or those representing your programs. Tell them that you are following up on a request from the #bFair2DirectCare Coalition that they write to the Governor urging him to include funding to increase the salaries of workers who care for people with developmental disabilities (three flyers with additional information on this request can be found here). Ask if they have taken action or if they need to have the request and sample letters re-sent. Since you will most likely speak to a staff person, ask for the email address of the staff person in the legislator’s office who will be responsible for following up with the member so that you can send them all of the information. Request that they send you a copy of their letter to the Governor and please forward a copy to bcrosier@cpofnys.org. Thank you! The unexpected election of Donald Trump as U.S. President and the continued Republican majorities in both the House and the Senate will create a cavalcade of politics and policy impacts on a very “Blue” New York State. State and local policy makers are looking at potential implications of President–elect Trump’s promises and proposals. Some of the proposals that would directly impact New Yorkers include: dismantling the Affordable Care Act (which could cost New York State more than $800 million a year); block granting Medicaid; “Modernize Medicare;” dismantling the Todd-Frank Act; investing $550 billion in infrastructure and many other proposals which can be found at President-elect Trump’s website: https://www.greatagain.gov/policy/healthcare.html. The big question at the state level was whether or not the Senate Republicans would continue to hold their majority in the State Senate, and it appears that they have a governing majority by claiming Brooklyn Democratic Senator Simcha Felder as a member of their conference. Senate Republicans finished ahead in 31 districts, although recounts on Long Island could keep the exact tally unknown for weeks. Republicans gained a seat in Buffalo, with the election of Chris Jacobs, but with absentee ballots yet to be counted, incumbent Republican freshman Senator Michael Venditto is 33 votes behind his Democratic challenger John Brooks. It’s still unclear how the Senate Chamber’s Independent Democratic Conference (IDC) will align itself. The conference, which has previously allied with Republicans, grew to seven members with the addition of Senator Jesse Hamilton (D-Brooklyn) on Monday. Prior to the election, when it looked like the Senate Democrats might take a clear majority, there had been speculation that the IDC might ally with their Democratic colleagues. But with the Republicans in the majority, there has been no public discussion of the IDC’s position although current speculation is that they will join with the Senate Republicans. The Assembly Democratic Conference increased their clear majority in the state Assembly to 107 in the 150-member Assembly Chamber. Democrats picked up a Plattsburgh-area seat that had been held by Republicans for decades, most recently by retiring Assemblywoman Janet Duprey, when Franklin County legislator Billy Jones won by approximately four points. Monica Wallace regained a traditionally Democratic seat in Buffalo with the retirement of Assemblywoman Angela Wozniak. The night’s biggest surprise for the Assembly came in Long Beach, Long Island with the loss of Harvey Weisenberg’s old seat. Democrats lost this seat that they had held since 1965. The district was most recently represented by Todd Kaminsky, who vacated the Assembly seat when he won a Senate special election in April. Republican Missy Miller, an advocate for the state’s medical marijuana law, defeated Democrat Anthony Eramo by about six points, to add this seat to the Assembly Republican Conference. Only one Assembly incumbent was ousted. Assemblyman John Ceretto, who was elected to three terms as a Republican but joined the Democrats last year, was defeated by nine points by Republican former Niagara Falls Judge Angelo Morinello. As long as they hold on to these seats, the 107-member conference gives Assembly Democrats absolute control of the occasional proceedings that require a majority of the full 213-member Legislature, such as electing Regents and filling vacancies in statewide offices. A complete breakdown of the 2016 New York State Senate and Assembly elections can be found here. Provider groups – including CP of NYS – representing more than 250 not-for-profit agencies supporting New Yorkers with disabilities have issued a report calling for a review and refocusing of the New York State Justice Center for the Protection of People with Special Needs. The report, “The Justice Center: Opportunity Missed,” is based on responses to a survey from organizations across the state that provide supports and services for people with disabilities. The report was issued on November 2 by the Alliance of Long Island Agencies (The Alliance), the Developmental Disabilities Alliance of Western New York (DDAWNY), the Coalition of Provider Associations (COPA), and CP of NYS. It asks for a thoughtful examination and evaluation of the Justice Center with an eye on its impact on the human services provider community. “We hope that this report’s findings will prompt real change and restore good judgment and common sense related to the severity of conduct. In short, it’s time to hit the ‘reset’ button on the Justice Center,” said Susan Constantino, President & CEO of CP of NYS. The 2016 CP of NYS Annual Conference began on Monday, October 17 with a Keynote Luncheon speech by Kerry Delaney, Acting Commissioner of the NYS Office for People With Developmental Disabilities. The CP of NYS Annual Elks Award was presented to Kathleen Fletcher at the luncheon and Mark Kearney, from CP of NYS Affiliate AccessCNY in Syracuse was honored as winner of the 2016 CP of NYS Visions of New York art contest. The conference ended on October 19 with a presentation on fitness, nutrition, and sports by representatives from The Center for Discovery, Cerebral Palsy of the North Country, and Cerebral Palsy of Long Island. 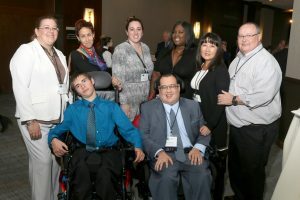 In between, more than 650 people attended 50 educational sessions and meetings on topics important to people with disabilities, their families, and the organizations and people who support them. The Monday afternoon conference schedule featured 10 educational breakout sessions on numerous topics. Those sessions included a presentation on CP of NYS Supplemental Needs Trusts, a look at Innovative Community Living Options, and an update on policy and legislation at the federal level. The Annual Awards Dinner on Monday, October 17, featured a celebration of the 70th Anniversary of the organization. A three-part video produced by CP of NYS tracing the history of the organization and its Affiliates was shown during the Monday evening event. The highlight of the evening was the presentation of the prestigious Al Felmet Achievement Award to Jacqueline Rodriguez (Queens Centers for Progress), Kevin Christman (Cerebral Palsy of Long Island), and Richard Whaley (Center for Disability Services). Tuesday offered more than two dozen educational sessions throughout the day on topics ranging from Telemedicine, Crisis Communication, the benefits of Yoga, and DSP best practices. As in past years, the Tuesday evening Staff Recognition Dinner was a chance to honor more than 70 outstanding Affiliate staff members from across the state and view informative, and sometimes hilarious, videos produced by the Affiliates. The 2017 CP of NYS Annual Conference is scheduled for October 30-November 1 at the Saratoga Hilton in downtown Saratoga Springs. Additional information, PowerPoint presentations from many of the sessions, our on-line Ad Journal, and the 70th Anniversary History Video can be accessed on our website at https://www.cpofnys.org/2016-annual-conference/. The NYS Department of Health (DOH) and the Centers for Medicare and Medicaid Services (CMS) have agreed to extend the FIDA Demonstration through December 31, 2019. The FIDA Demonstration was originally approved to run from January 1, 2015 through December 31, 2017. Last year, CMS offered states an opportunity to extend their demonstrations through December 2019. Having previously submitted a non-binding letter of intent to extend the demonstration, DOH has now formally accepted the opportunity from CMS and has officially committed to the two-year extension. This extension does not include the FIDA-IDD demonstration. The FIDA-IDD demonstration is on a separate timeline and will run through December 2020. In addition, DOH has indicated that, pending final review of the Medicare provider networks, they anticipate rolling out FIDA to Region 2 in 2017. More information on this will be available in the coming weeks. 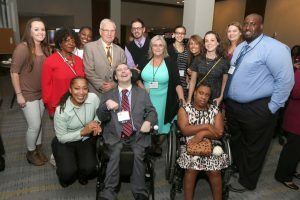 At this year’s Self-Advocates of New York State Conference, CP of NYS Affiliate AccessCNY was recognized as Agency of the Year for the support of its Self-Advocacy club. The award is given each year to an agency nominated by a Self-Advocate group. 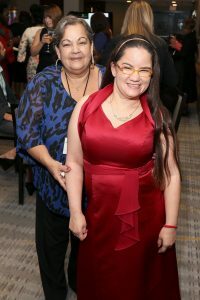 The AccessCNY program supports people with disabilities who learn how to speak up for themselves, help others and build skills along with friendship. Congratulations to AccessCNY! The Justice Center for the Protection of People with Special Needs announced the winners of the first annual Code of Conduct Recognition Award for 2016. This award honors staff who embody the ethical standards outlined in the Code of Conduct for Custodians of People with Special Needs. Family members, personal representatives, and provider agencies submitted the names of 60 candidates to the Justice Center and 17 individuals were selected for recognition. Of those nominees, the Justice Center’s Advisory Council selected four individuals to receive the 2016 Code of Conduct award at an award ceremony held on September 29. One of the 17 honorees was Lisa Getman, Sr. Vice President Corporate Compliance/HIPAA Officer from CP of NYS Affiliate Upstate Cerebral Palsy in Utica. Congratulations, Lisa Getman! Mary Walsh Boatfield, President and CEO of Happiness House, CP Rochester, and Rochester Rehabilitation, was recently named Executive of the Year for 2016 by the Rochester Business Journal and the United Way of Greater Rochester, Inc. at a ceremony held at the Rochester Riverside Convention Center. The awards program recognizes contributions in the non-profit sector. Ms. Boatfield was recognized for her outstanding record of innovative leadership in providing services. Rochester-area individuals and organizations were honored in seven categories: Board Leadership, Career Achievement, Community Champion, Executive of the Year, Rising Star, Outstanding Corporate Volunteer Group, and Bank of America Impact Award. Congratulations, Mary Boatfield! Shop at smile.amazon.com and United Cerebral Palsy Associations of New York State Inc. can increase its AmazonSmile donations. #StartWithaSmile at smile.amazon.com/ch/13-1623856 for your holiday gifts and Amazon donates to CP of NYS. Check out the site, find something you like, buy it and CP of NYS will benefit. We would like to express our sincere thanks to Kohl’s of Saratoga Springs, New York. Their leadership team provided behind-the-scenes support preparing materials for our annual conference. In addition, they generously provided a $1,500 grant which will be used towards education programs. Through the Kohl’s Volunteer Programs, Kohl’s Associates donate their personal time to make a difference in their local communities by volunteering with eligible nonprofit organizations. With every qualifying event, volunteer efforts are rewarded with a $500 grant from Kohl’s to the benefiting organization. If your Agency is interested in obtaining the generous time of Kohl’s volunteers and a grant, go to www.kohls.com. Scroll to the bottom of the page and select community. Choose Associates in Action from the list on the left, then scroll down to the directions for requesting volunteers to complete the application. As the Kohl’s Volunteer Program is completed on Associates personal time, all volunteer requests may not be able to be fulfilled. Kohl’s volunteers (l-r) Sherri, Amy, Suzanne, and Darci, with Lorie Liptak (right) from CP of NYS, helping us get ready for the Annual Conference.